Memorial services for Viola C. Benting, 85, of Aberdeen, SD, will be 2:00pm, Thursday, January 31, 2019 at Spitzer-Miller Funeral Home, with Pastor Mike Jacobson officiating. Burial at Kelborn Cemetery in Corona, SD at a later date. Viola died Sunday, January 27, 2019 at home in Aberdeen. Visitation will be two hours before the service. Viola Christina Rieger was born on June 4, 1933 at Hillsview, SD to Philip and Elizabeth (Schneider) Rieger. She was raised in Hillsview and attended school in Artas, SD. On September 5, 1954, she married Alfred Benting in Pierre, SD. She worked at the South Dakota Developmental Center in Redfield until moving to Aberdeen, SD 1993. Here, she worked for Foster Grandparents and Head Start and volunteered for RSVP, various blood drives and the Brown County Emergency Management CERT program. 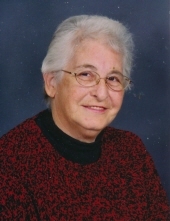 Viola was a member of Zion Lutheran Church, the V.F.W. Auxiliary and the Aberdeen Senior Center. She enjoyed gardening, reading, crocheting, knitting, cooking and baking. Above all, Viola was dedicated to her family, and enjoyed her time spent with her children, grandchildren and great-grandchildren. Grateful for having shared Viola’s life are her children: Rick (Dianne) Benting, Redfield, SD, Marcia Thonvald, Britton, SD, Rita McBroom, New London, MN, Mark Benting, Aberdeen, Vickie Bruce, Aberdeen, Craig (Lac) Benting, Milpitas, CA, sister: Alma Ottenbacker, Sioux Falls, SD, her grandchildren: John Benting, Tim Benting, Laura Durfee, Derek Benting, Melanie Folk, Michelle Erb, Shaun Sarvis, Kara Slaba, Brandon Thonvald, Aly Smith, Matt McBroom, Brittany Bruce, Alaric Benting, Anton Benting and Annalise Benting; and nineteen great grandchildren. Preceding Viola in death are her parents, her husband: Alfred Benting, daughter: Wanda Sarvis, step-son: Steve Benting, brothers: Albert, Milton, Richard, August and Mort Rieger, sisters: Martha Ackerman, Gertie Gehring, Lorainne Ackerman and Del Paulson, and beloved pet: Princess/Junior. In lieu of flowers, the family prefers memorials to the Lupus Foundation of America; 2121 K St. NW, Ste 200, Washington, DC 20037. To send flowers or a remembrance gift to the family of Viola C. Benting, please visit our Tribute Store. "Email Address" would like to share the life celebration of Viola C. Benting. Click on the "link" to go to share a favorite memory or leave a condolence message for the family.